A Wedding Suite is a set of various types of Stationery Cards that all feature the same matching design. For example, a suite could contain coordinating wedding invitations, programs, thank you cards and more. Select Card Store from the main menu and then choose Stationery Cards. 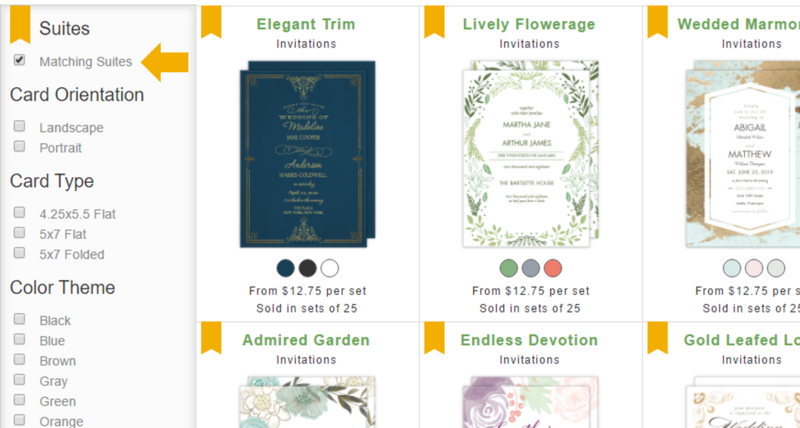 Select Weddings from the Sam’s Club Stationery menu. Click on Wedding Suites Cards. 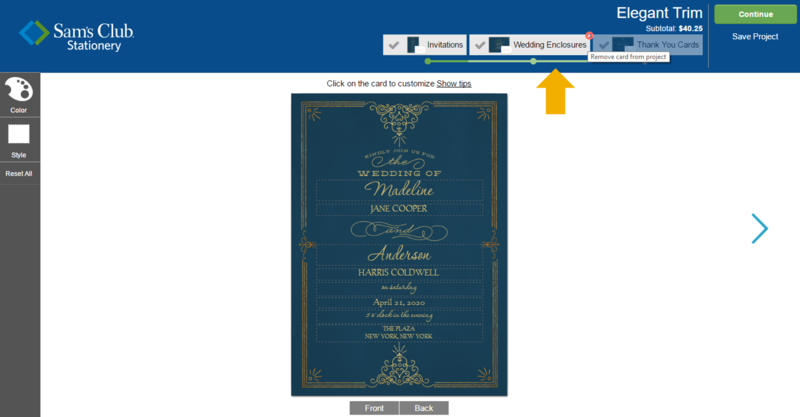 Alternatively, if you are browsing wedding cards in a specific card category such as programs or RSVP cards, you can use the menu on the left to filter results by “Matching Wedding Suites” to show which designs are available as a suite. 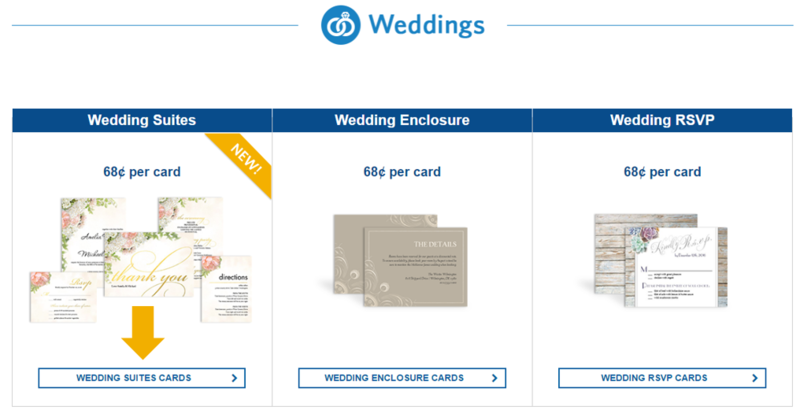 From the Wedding Suites page you can view the available suite designs and card customization options. Click the small arrows underneath the suite preview to view each card in the suite. You can see a larger version of the card by clicking on the preview. If a card has multiple color options, they’ll be displayed as swatches below the preview of the card. Click on a swatch to view that color. If a card has multiple corner styles, click on a corner shape to change it in the preview. Click the plus (+) symbol on each card type that you would like to include in your suite. To select all cards, click Buy Entire Suite. Selected cards will show a checkmark symbol. When you have selected all the cards for your suite, click Personalize. You can now personalize the photos, text and envelopes for each card in your suite. Click here for help with designing your cards. Above the design tool you will see the card suite menu. Cards that have already been successfully personalized will feature a green checkmark next to them. The card you are currently working on will be brightly lit. To remove a card from your suite, place your mouse over it in the card suite menu and click the small red "x" symbol that appears in the corner. Once you have personalized all cards and envelopes in your suite, you will be able to approve and set an order quantity for each one. Cards in your suite will appear as individual listings in your shopping cart. Learn more about completing your order.